Revival is a nod to Kevin’s formative years, offering a proper version of the traditional Sunday dinner. Following Kevin’s allegiance to Southern cuisine, Revival focuses on farm-fresh ingredients and a dining experience that reflects the traditions his own family follows. Watch the video below to learn more about Chef Kevin Gillespie and Revival. Nicole’s earliest career experience, after earning her culinary arts degree and a Bachelor of Science in culinary nutrition from Johnson and Wales University, was with Operation Frontline Colorado/Share Our Strength in Denver. During this time, she organized and taught cooking and nutrition classes throughout the state while also working at The Brown Palace Hotel and Spa. But once she experienced the energy of a restaurant kitchen, she never looked back. She later worked as s a line cook at Café Boulud in West Palm Beach, Florida. Her time in Florida also included two years working for Michelle Bernstein at Sra. Martinez and Michy’s. Nicole then went on to work for chef Stephanie Izard at Girl and the Goat in Chicago as a line cook and then sous chef, where she developed the skills to feed 350-600 guests every evening in an extremely fast-paced environment. Prior to Girl and the Goat. Her love affair with Southern cuisine first began when she moved to Atlanta in 2014 and served as executive sous chef at Watershed on Peachtree. There, she was exposed to both Creole-style Southern food as well as more modern takes on traditional Southern flavor profiles. Nicole considers one of the biggest highlights of working at Revival to be the tight-knit, welcoming community of people who work at the restaurant. Passionate about finding new ways to create flavor profiles and present her food, she aims to strengthen both her culinary and management abilities while collaborating with Kevin. A Georgia boy born and raised, Joe started his restaurant career at Harbour Pointe Reastaurant on Lake Tobosofkee in his hometown of Macon, Ga. He has since worked almost every position a restaurant has to offer, from meat slicer to bartender in concepts from fast food to college bars. 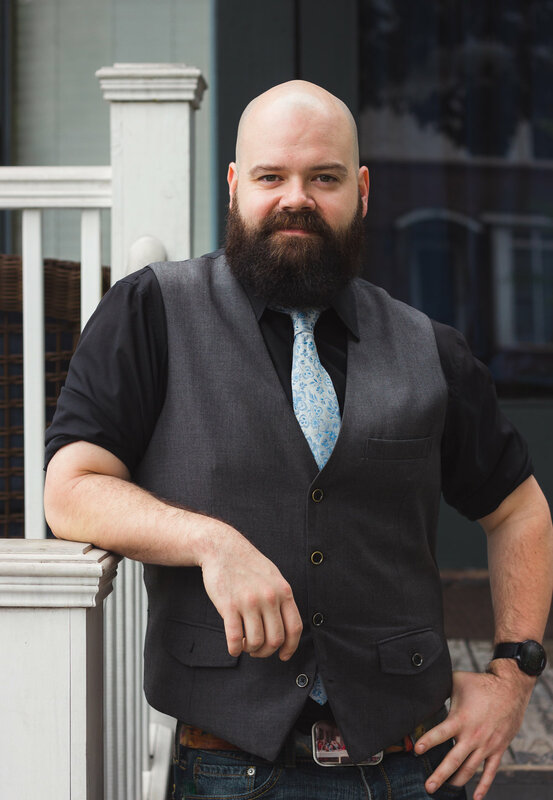 He moved to Atlanta in 2016 to join the RedBeard team as a server at Gunshow and, later, Revival, where he is excited and proud to lead the service team and to continue to give Atlanta some of the best southern food this state has to offer. Revival is a nod to Kevin Gillespie’s formative years in the South, when gathering together for family suppers played a significant role in his life. The restaurant’s menu is a reinterpretation of what one would find at Gillespie’s grandmother’s house: a classic, Southern spread that features farm-fresh ingredients and also showcases refined culinary techniques. The building where Revival is located was originally a home owned by the Campbell family of Decatur in the early 1900s – a home where couples courted one another in the parlor, where children were born and where generations of memories were made. It has since housed everything from law offices to restaurants, but the Revival team has restored the space as closely as possible to its original condition to reinstate that homey atmosphere. When guests dine at Revival, they will feel the importance of sitting down and sharing a meal with loved ones – the same traditions that Gillespie’s own family held dear. Revival has several private dining options to choose from ranging in size from intimate family dinners, to day and evening meeting spaces, all the way up to large corporate style events and wedding receptions for up to 100 guests. Reservations are recommended but not required. You can make a reservation by using the Resy widget on the website, or by calling (470)-225-6770. What are the hours of operation? Click Here for Our Current Hours! Do you have outside seating? We have a covered patio and, when the weather is nice, we open up the front porch for seating. You can make a reservation for up to nine online. For anything larger than that, please call the restaurant. You are welcome and intended to park out behind our home. We have a lot and complimentary valet service. Take a look at our menus, which change regularly based on what's in season or available from our farmers. Come as you are. Unless you are in a seersucker suit, in which case come to Sunday dinner. Can you bring your own wine and/or cake? Yes, but we have a corkage fee and a cake cutting fee. Fill out online application! Red Beard Restaurants is always accepting general applications for employment within our company. Click here to apply. Gunshow, Atlanta's most unique restaurant, is seeking talented culinarians. Come join the team of Kevin Gillespie's talented cooks as they prepare and offer their own creations to guests "dim sum style" as they are prepared. No ticket printers. No stress on the food -- just delicious creations that are artfully and carefully crafted and served by the individual that prepared it. Gunshow's mantra is that anything can be on our menu at any given time. We do not place restrictions on specific themes or genres of cuisine. Instead, we encourage creativity from EVERYONE while utilizing local farms and goods. Every cook prepares two dishes each night, rotating them and offering them to guests throughout the night. Each week, executive chef Chris McCord leads menu development sessions where the team can present ideas, concepts or whole dishes for review and discussion by the group as a whole before being approved to go on the following week's menu. This means EVERY COOK has a voice as to what he/she is cooking! Must be a self-starter who is able to produce and execute on their own power. Minimum 2 years of fine dining/farm-to-table experience. Must be able to speak and interact with the guests comfortably. Must get along well with others. More about Gunshow: Chef Kevin Gillespie's popular Atlanta restaurant, Gunshow, offers a bold, new take on the traditional dining experience. Inspired by Brazilian churrascaria-style dining and Chinese dim sum, Gillespie combined the two for a decidedly fun and delicious result. Helmed by executive chef Chris McCord, chefs present dishes to diners at their tables where they can choose what to accept or pass, while cocktails are made tableside on a rolling cart. Gunshow, open for dinner Tuesday through Saturday, earned a spot on GQ's list of "12 Most Outstanding Restaurants" in 2014 and was included in Eater's "The National 38" list of places to eat in America in 2015 and 2016. About Red Beard Restaurants: Red Beard Restaurants is the parent company that oversees Atlanta chef, restaurateur, speaker and cookbook author Kevin Gillespie's food and beverage ventures, including his restaurants Gunshow and Revival, his BBQ pop-up Terminus City and all of his merchandise. We are located down from Twain’s at the corner of East Maple St. and Church St.